We are the leading manufacturer and supplier of Catalog Stand and we required buyers from all over india and we mostly entertain buyers having bulk order quantity orders . 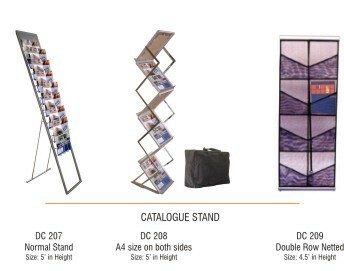 These stands are used to put magazines , newspapers and books and usually use in homes , libraries and offices . Standard Rollup is a slim and user-friendly retractable banner with an attractive design. The roll up banner stands have collapsible sides. These are easily reachable from one place to another. It is a easy to handle, very stable. We are the leading manufacturer and supplier of Roll up stand and we required buyers from all over india and we mostly entertain buyers having bulk order quantity orders .